There is an extremely avoidable mistake pervasive in sales teams that is wiping out revenue. I am on a mission to spread the word. We’ve all read the stats about the importance of follow up in sales. In a nutshell: most sales are made after contacting a prospect several times, yet most business people give up after one or two tries. The general assumption is that following up with prospects can be uncomfortable, therefore many salespeople surrender quickly due to fear or doubt. Seasoned salespeople might look at those stats with their nose in the air, assuming that their rainmaker status excludes them from this sales-stunting habit. But, a few years ago, something happened that caused me to understand this statistical parable from a new angle. Years ago I belonged to BNI, a networking group that meets weekly for breakfast. Members of the group are encouraged to bring guests, so there were always new people to meet each week. One morning I saw a new face from across the room. Since I was president of the group at this time, I walked over to introduce myself, as I had done many times before. When Jill (name changed to protect the innocent) told me her name, it seemed quite familiar, but I meet lots of people so that wasn’t entirely out of the ordinary. When she handed me her card, I was horrified. Jill and I had spoken on the phone multiple times several months before. In fact, we had exactly two conversations about redesigning her website and she was positive that she wanted to do business with us, but was leaving for Asia for a three-week business trip and wanted to table the conversation until she got back. Nothing out of the ordinary there, so I am sure that I made a note in my CRM and planned to call her about four weeks later. But I hadn’t. In fact, I had completely forgotten about Jill. And now here she was standing in front of me with the same awkward regret of losing touch. 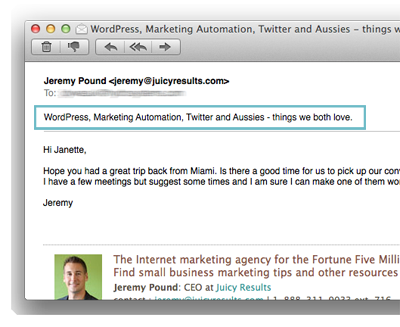 I sheepishly asked about her trip and current state of her Internet marketing and she seemed delighted to be reconnected and even apologized for not getting back to me. I felt awful about letting someone so pleasant and professional drop off of my radar. Jill and I ended up working together. In fact, I ended up doing even more business with her husband whom she referred to us. But all of this business was nearly lost because I did not have a dated follow up in Jill’s CRM record. Upon investigation I realized that we had started a large marketing campaign the week after Jill left for Asia. We received a high volume of new leads, distracting us from clients like Jill who were early in the buying process. I found that I had great notes about Jill’s needs, her trip, and what I was going to do next. But, I had no follow up task assigned and dated to trigger me to take that prescribed action. That incident taught me that even sales professionals with the highest immunity to rejection are unknowingly contributing to the follow up deficit and losing out on tons of revenue. They are relying on memory or notes to follow up, but those are not scalable. Business today is conducted at an accelerated pace and an exponential scale. Luckily, almost all of us already have the tools in place to prevent these mistakes. So how do we plug this revenue-generating hole? I am sure you already know my multi-million dollar tip for maximizing your CRM. But the important question is, will you make it a habit? I’ve taken the time to tell you that story about Jill to punctuate how expensive overlooking just one follow up can potentially be. After all, CRM stands for customer relationship management, so are you using yours to manage relationships or just take notes and check off tasks? Always, always, always have a dated next step for every person in your CRM. That is, define your next step for advancing the relationship, and when you will do it. In most CRMs, this takes the form of a task assigned to you with a date. You cannot bury the task in a note and expect it to happen without fail. It is unreasonable to page through dozens, hundreds, or thousands of customer records each day. Always have a next step scheduled for every contact. After adding notes from a call, before I leave a record, I ensure that there is a next step defined. That might be a reminder to call them tomorrow, an email next week, or even a check-in next year. Set that date in advance, and honor that follow up unless things have changed. In which case, define a new next step! 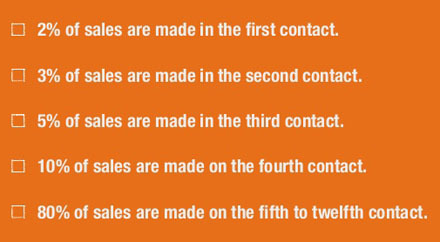 Remember, most sales are made after the fifth contact. If you’re waiting on the client to contact you, you’re only helping your competitors—I hope they are sending you thank you cards! If you’re a sales manager, I recommend you spot check records with your team at least once per week to make sure every record has a clear next step. Follow up at an agreed upon time with an active prospect. Send helpful information to a past prospect or referral partner. Check in on satisfaction of a prospect who hired a competitor (this one is gold!). Check in on the progress of a project for a client that I sold. Follow up to ask for a referral 30 days after a client starts doing business with us. Chet Holmes, author of The Ultimate Sales Machine, would craft over a dozen follow ups for his sales team in advance to ensure that they would push through to the tipping point. In this video about perfecting your follow ups, Holmes explains how “massive, diligent and entertaining follow up” is one of your best competitive advantages because most companies are weak at following up. This especially applies after the sale has been made. Don’t be lazy with your follow ups and touch points. I’ll admit that a bland follow up is better than silence, but the best sales professionals send emails that educate, entertain and inspire. 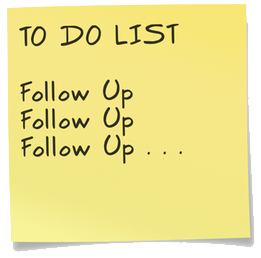 Avoid the “Just Following Up” Email whenever possible. It’s trite and self-interested. The best sales professionals have their phone calls answered and voicemails returned because they are either extremely entertaining and/or have built incredible authority with their prospects. Find a meaningful way to follow up, and do it on time, every time, and you will add zeros to the right side of your sales revenue.